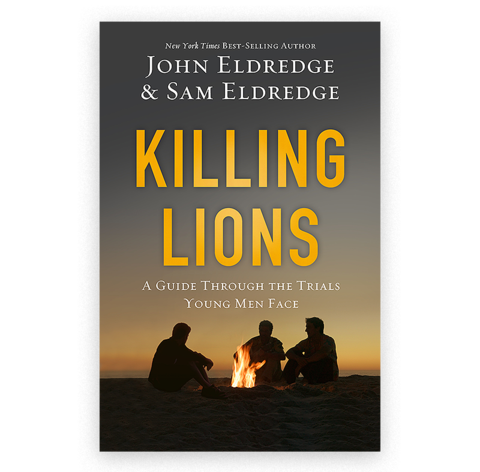 The book 'Killing Lions' is a conversation between John and Sam Eldredge about the trials young men face. Our starting place is to ask God what he thinks of us, to allow our Father to speak to us as sons. Then from there we begin to get active in the process of seeking and receiving identity and validation. God always treats a man like a man; he honors our involvement, invites our participation. Get active in the process: Where do you feel weak? Where do you need some shoring up? "Killing lions” is all about finding validation through genuine victories fought out of our true heart, from which we emerge with a genuine strength and sense of self. When you know you have accomplished that, it settles some important questions deep inside and allows you to move into your world with courage. The most fearsome lions will be the ones that roar with the sound of our historic shame, trying to cower us back into the false self, back to the script we were handed not by God but by The World (and ultimately by the evil one).